Today we unveiled the new look to the website. Please be patient while all of the bugs are being fixed. The new site will have a simple mobile version shortly that will allow users to view the most important elements of the site from their Blackberries, Android and iPhones. In the meantime, be sure to subscribe to the RSS feed and sign-up for the newsletter to receive the latest news and information from Formula DRIFT. 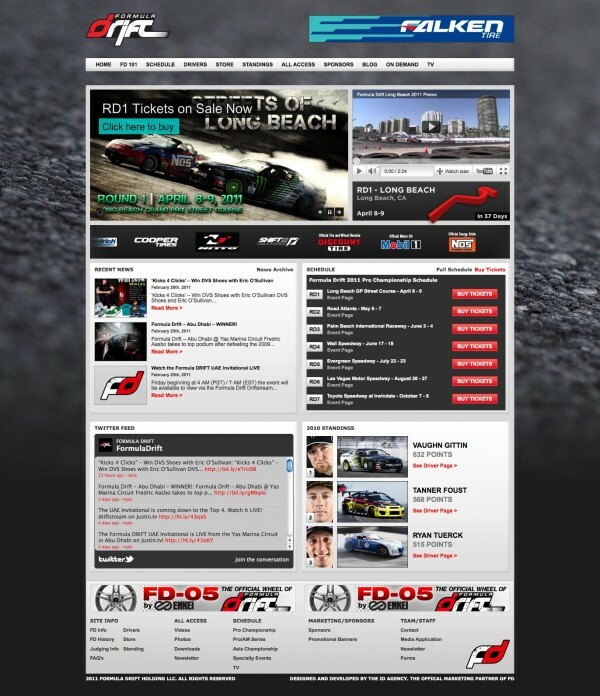 Long Beach, Calif. – February 18, 2010 – Formula DRIFT has revamped the company’s current website, www.formuladrift.com, with updates to current features as well as adding a new component to the website, “FDTV”. The Formula DRIFT website redesign includes updated streaming news and press releases on the homepage, further optimization of the Pro Championship schedule component, and integration of Twitter updates from the Series and featured guests. One of the most robust new features integrates a new video player on the homepage that incorporates both Vimeo and YouTube videos proprietary to Formula DRIFT. The viewer also acts as a player and browser for Formula DRIFT TV shows that have aired on G4, ESPN2, and SPEED. Formula DRIFT will progressively release TV shows to the player and fans can watch those shows directly from the Formula DRIFT website. The 2005 season featured on G4 has just been released and subsequent years will be released throughout the season. The updated All Access Pass section, which will host this content also allows members to view exclusive content to the website including image galleries and wallpaper downloads. The main element of All Access is the new FDTV, which will feature archived episodes of Formula DRIFT programming beginning with the 2005 season. Featured episodes will be added monthly throughout the season. Membership for All Access is free. Round 1: Streets of Long Beach tickets are available via the Formula DRIFT website at www.formuladrift.com, Ticketmaster outlets, and the Long Beach Convention Center box office. Ticket prices start at $27 online with reserved tickets available for Saturday’s competition day. 2-day packages are also available along with VIP ticket packages.